The installer is also familiar to those who have worked with Ubuntu in the past, and suffice to say that there isn’t anything shocking or surprising there. I utilized my favorite platform for reviewing new Linux distros, my trusty and aging Toshiba Satellite A75 (Pentium IV 3.06 GHz hyperthreading CPU and 1.25 GB of RAM). Wireless worked fine right off the bat, as I’ve come to expect from any of the Ubuntu-based distros I’ve tried over the past year or so, so there were no issues there. The installer took about 20 minutes or so to complete, and once it was done and rebooted, I was able to see what I had on my hands. Peppermint is, as I had mentioned, focused on social media and the cloud, so most of the applications aren’t local apps at all, but webapps. As a result, there is no default mail client, no default installed office suite, no image editing software… as a matter of fact there really aren’t very many local applications installed at all. What Peppermint does come with is an array of cleverly implemented webapps utilizing the Mozilla Prism application to make those webapps seem a bit more like local ones, even though they’re not. As such, for mail, there’s a Google Mail launcher under the “Office” submenu (which I found to be a bit of slightly odd categorization), which launches a no-frills separate browser window with no controls that navigates to a GMail login page. Likewise, there is a Google Docs launcher, and a Google Calendar launcher, and Google Reader (for RSS feeds), and all of these live in their own, separate windows, just like they would if they were local applications. Along the same lines, for those of you who use Twitter and Facebook, there are launchers under the “Internet” submenu for Seesmic (a web-based Twitter client) and Facebook, which, like the various Google webapps I already mentioned, are both launched in stripped down Prism windows to make them look and act like local applications. There is also Aviary Phoenix image editor, an image editing webapp, as well as Aviary audio editor (called “Myna”), and a couple of handy music stream site launchers for Last.fm and Pandora, along with something I thought rather novel called The Cloud Player. While it might sound like there really isn’t anything installed at all when it comes to applications (since all of the ones I just listed are in fact simply webapps that live in a trimmed down browser window), there are some real apps included on a Peppermint installation. Peppermint is built around LXDE, so it comes with PCManFM for a native file manager. Also included is Galculator (a lightweight, basic calculator program), the Leafpad text editor, a basic screenshot app, the ever-present Firefox browser (of course), Xfburn for CD burning, Transmission for torrenting, and a number of other basic applications. One app that stood out as a bit of an unusual inclusion was the now discontinued music player known as Songbird. More on that later. So while many of Peppermint’s bundled applications are webapps (as one should expect in a cloud-centric distro like this is intended), it does come with an array of other useful tools and applications, and with only a couple of exceptions, these were chosen with speed and minimal resource intensiveness in mind. Peppermint OS uses the NetworkManager Applet for network connectivity (including wireless), and mintUpdate as its update manager, both of which seem to work perfectly on my laptop. Xscreensaver is also included by default, though only a couple of the usual screensavers (“Fuzzy flakes” and “Fiber lamp”) are installed out of the box. I like variety in my screensavers, so I manually installed the rest via apt-get, but I am sure these were left out due to space considerations. 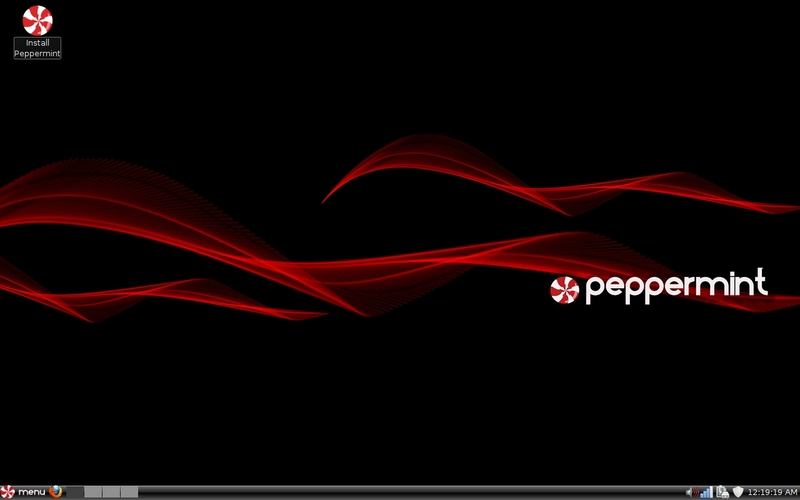 Peppermint also comes with the Peppermint OS Software Manager, which is an easy way to add any of the very numerous applications out there that work on Ubuntu-based distros.